The Leatherman Wave 17-in-1 All-Purpose Multi-Tool is the ideal equipment for outdoor enthusiasts and professionals alike. The multi-tool has been redesigned with all-locking blades, larger knives with bigger thumbholes and large and small-bit drivers for customized use. 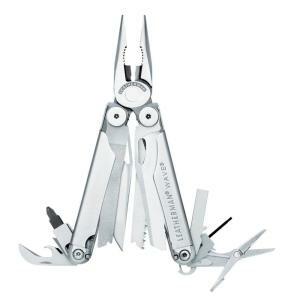 Tbook.com crawls the web to find the best prices and availability on Leatherman and related Tools and Hardware products like Leatherman Tool Group Wave 17-in-1 Multi-Purpose Tool. For this page, related items include products we find that match the following keywords: "Leatherman" at our vendor partner Home Depot. Leatherman Tool Group Wave 17-in-1 Multi-Purpose Tool is one of 14 Leatherman and related products listed in the Tools and Hardware section of Tbook.com If you have any questions on this product, please give us a call at 734-971-1210 during the hours of 9am - 5pm EST for assistance. Thank you for shopping at Tbook.com, the Internet Department Store!